Eastern Bioplastics President Sonny Meyerhoeffer . If you’ve ever been stuck behind a truck loaded with live poultry on a Shenandoah Valley road, you may have wondered: What happens to all of those feathers after processing? Eastern Bioplastics in Mount Crawford converts poultry feathers into plastic resins and oil-absorbing material for commercial applications. Eastern Bioplastics works with manufacturers to develop composite resins that can be combined with other materials during production. Much of the company’s development to date has involved feather fiber-reinforced injection molding used to make office furniture, automotive parts, horticulture containers and sporting goods. Because the plastics industry relies on crude oil and natural gas, the use of poultry feathers, a renewable resource, can help reduce its carbon footprint. Another practical application for poultry feathers is as an absorbent. Eastern Bioplastics recently introduced a feather-based material, Environmental Bioprotector, which is capable of absorbing seven times its weight. The absorbent can be used to capture leaks under machinery or to remove oil from water-based solutions. The material is available in sock or pillow form and as a powder. 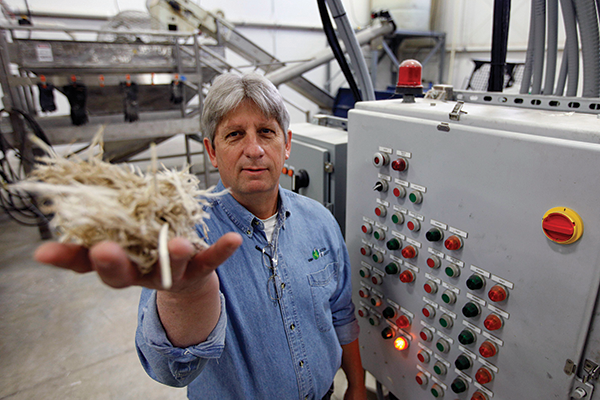 Founded by Sonny Meyerhoeffer, who formed the Virginia Poultry Growers Cooperative, Eastern Bioplastics’ leadership team also includes research and development engineer Justin Barone, who was on the U.S. Department of Agriculture team that first discovered that the keratin protein in feathers could be processed into a biodegradable polymer. If the health of the local poultry industry is any indication, Eastern Bioplastics will have no shortage of feathers for the foreseeable future. Virginia Poultry Growers Cooperative is building a new 80,000-square-foot turkey processing facility in Hinton. The $62 million expansion during the next three years will be supported by additional investment in the company’s feed mill in Broadway and its grain elevator in Linville. The cooperative was hatched in 2004 as a way to save nearly 170 farms and 1,800 jobs in the wake of the decision to close the local Pilgrim’s Pride processing plant. The co-op is now the eighth-largest turkey processor in the U.S. and one of the largest suppliers of organic and antibiotic-free meat. It purchases and processes about 7 million turkeys per year. The region, in fact, was well represented at the Governor’s Agriculture and Industrial Biotechnology Conference in September. The event, held at the Institute for Advanced Learning and Research in Danville, brought together public and private partners representing existing ag-bio businesses as well as research universities and marketing and economic development officials. The valley already counts a number of biotech companies. In addition to Eastern Bioplastics, the region is home to Micron Bio-Systems in Buena Vista, part of a global biotechnology firm that develops science-based solutions to agricultural challenges, including animal nutrition, land use and environmental changes. The region also is home to pharmaceutical giant Merck, which has a manufacturing facility in Elkton, and drug researcher SRI Shenandoah Valley, located in a 240-acre research park in Rockingham County. The valley also hosts medical manufacturers Hollister Inc. in Stuarts Draft and Thermo Fisher Scientific in Middletown, a leading supplier of lab products and equipment. In early 2011, local leaders met to discuss how to take advantage of converging interests in agriculture, tourism and the local foods movement, and to develop a program that would benefit the region as a whole. These discussions laid the foundation for Fields of Gold, a partnership involving local governments, economic development and tourism entities, agribusiness and valley farmers. Residents and valley visitors can travel along the Fields of Gold Farm Trail, which includes nearly 200 farms, wineries, breweries, nurseries, roadside stands, bed-and-breakfasts, farm-to-table restaurants, farmers markets and festivals. 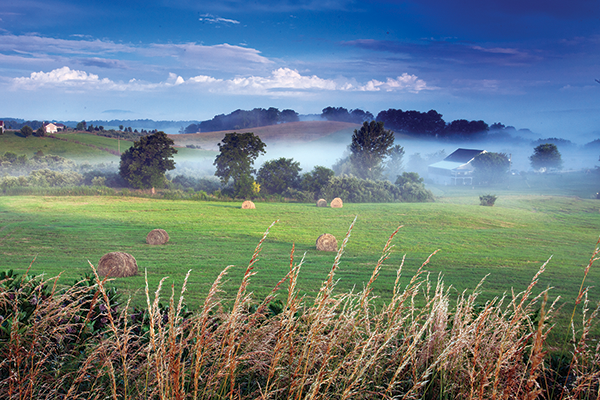 “The trail is really an agritourism roadmap for the region,” says Chenery, the SVP executive, adding that smaller producers and entrepreneurs have benefitted by marketing their products collectively. The program was recognized this year with a Community Economic Development Award from the Virginia Economic Developers Association. In addition to developing agricultural ventures, the valley is developing its future manufacturing workforce by expanding the use of registered apprenticeships. The Shenandoah Valley Workforce Development Board recently was awarded a $4 million grant from the U.S. Department of Labor to launch the Valley to Virginia (V2V) Apprenticeship Initiative, an effort involving more than a dozen partners in business and education. The project will target skilled trades such as mechatronics, industrial maintenance technicians, machine operators, welders and production technicians. Key business partners include A.G. Stacker, Andros Foods North America, Ball Advanced Aluminum Technologies Corp., The Hershey Co., Kraft Foods, Thermo Fisher Scientific, R.R. Donnelley, Tenneco and the Virginia Manufacturers Association. Grant funds will be used to offset the cost of related instruction in apprenticeship programs typically offered at technical schools and community colleges. The initiative also will develop work-readiness training for pre-apprentice candidates through Goodwill Industries of the Valleys. “This grant award is a huge shot in the arm for regional apprenticeship programs aimed at enhancing the skilled workforce in advanced manufacturing,” says Sharon Johnson, CEO of the Shenandoah Valley Workforce Development Board. V2V is expected to build support for the Registered Apprenticeship Journeyman credential, which is expected to produce 600 new registered apprenticeships throughout Virginia. Shenandoah Valley Partnership also has begun the in-Demand/Valley Career Hub campaign designed to increase awareness of high-wage, high-growth, high-demand career opportunities in the region that require some training beyond high school but do not necessarily require a four-year college degree. SVP has enlisted Harrisonburg television station WHSV-TV3 to produce a series of three-minute video spots in support of the inititive. They will air every other week over the next year. “These are good jobs, high-paying jobs, and they’re available right here in our community,” Chenery says. 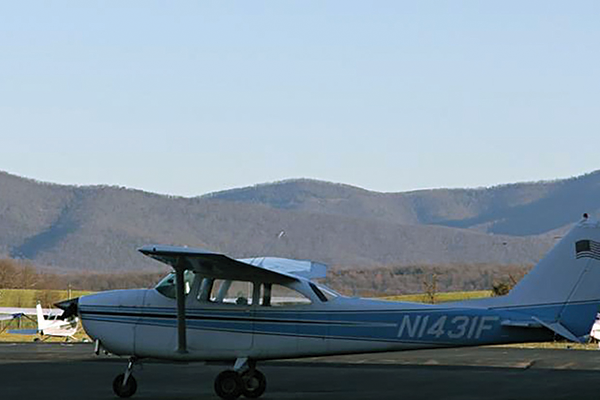 Blue Ridge Community College, which partners with Blue Ridge Aviation to operate a flight school in the region, is now offering the state’s first public commercial pilot program. The 17-credit-hour curriculum provides the educational background, skills and federal certification required to become a commercial pilot. Students are required to pay additional fees to cover the cost of the flight training. The valley also continues to see a wide range of economic activity, led by the warehousing sector. FedEx Ground has begun construction on a new distribution center in the Green Hills Industrial Park in Staunton. The facility will measure more than 200,000 square feet on approximately 30 acres. The new center will replace an existing station in Fishersville and is part of a nationwide FedEx network expansion to boost daily package volume capacity and enhance speed and service. It is scheduled for completion next summer. Meanwhile, Threshold Enterprises, a distributor of nutritional supplements and natural health and beauty products, has opened a new East Coast distribution center in Frederick County. The 78,000-square-foot warehouse in the Stonewall Industrial Park will enable faster delivery times for the company’s East Coast customers, who previously were served by Threshold’s facility in Santa Cruz, Calif.
Andros Foods North America — formerly Bowman Apple Products — is expanding its Mount Jackson plant and creating 160 jobs, marking one of the largest corporate investments in Shenandoah County’s history. The company’s plans include adding space and equipment to increase production of apple-based products. Another Shenandoah County business, Shentel, is acquiring Waynesboro-based nTelos in a $640 million deal, which includes wireless network assets, stores and approximately 300,000 retail subscribers in the mid-Atlantic region. A Sprint wireless affiliate, Shentel will convert nTelos retail wireless customers to that brand. Valley cities continue to be ranked among the Best Small Places for Business and Careers, according to Forbes. Winchester (No. 15), Harrisonburg (No. 32) and Staunton (No. 55) were all named to the magazine’s list for 2015. The list is based on economic factors such as “gross metro product” — the total value of the local metro area’s goods and services — job growth, unemployment, median household income and college attainment, as well as quality-of-life considerations. Winchester was cited for its rich Civil War history and annual Apple Blossom Festival, while Harrisonburg is known for its vibrant downtown historic district, and Staunton is home to the Frontier Culture Museum, the Woodrow Wilson Presidential Library and The American Shakespeare Center. One valley attraction not mentioned in the Forbes list is The Factory Antique Mall in Verona, which is now the largest antique mall in the U.S. At 120,000 square feet, the mall houses more than 225 dealers and has recorded record-breaking sales every year since 2008. Opened in 1996, the Factory Antique Mall will celebrate 20 years of business next year. Over the years, the mall has seen an increase in interest from film and television production companies in using antiques as props. Recent patrons include the AMC series “Turn,” which focuses on George Washington’s spies during the Revolutionary War; Steven Spielberg’s movie “Lincoln,” which won the award for Best Production Design at the 2013 Oscars; and “Mercy Street,” a new PBS American drama series set in Virginia during the Civil War.